Yesterday, my old friend, Sylvia and her newly-reunited daughter visited again. 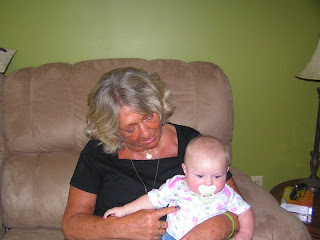 This time, she met her granddaughter and her great-granddaughter and great-grandson. Until a few weeks ago, she didn't even know they existed. These precious children will be able to grow up with something their mother and their grandmother didn't have...knowledge of their true heritage. They won't have to cling to a paper heritage pressed on them by genetic strangers. They won't have to feel obligated or "grateful" for anything but will be able to accept what is natural as any child does. As one of my own reunions takes another dip on the roller-coaster, I can only be happy knowing that what I didn't know before, I know now. I also know that my grandchildren and great-grandchildren will know who I am and where I am and what kind of people form their true and natural history. I had a dream, last night, where I saw my adult, reunited daughter standing on the edge of a precipice. She was looking for ways to climb down or a safe way to jump off and I was fearful for her. When I tried to talk her out of making that climb or leap, she said to me, "But I am going to have to if I am to get anywhere. The only other thing I can do is run back from the edge." She chose to run back from the edge. So many of us, mothers and adopted adults, stand on the edge of knowing and accepting truth and either keep standing or run back from the edge. It takes courage to jump or even climb down. It takes an open heart and mind to accept the truth. We sit on the peak of our fantasies and pre-conceived notions because the truth is scary. The problem is, that mountain-top can get lonely.The lies and false constructs of adoption have been the way of life for so long for so many that breaking out of that trap can be terrifying. But is the alternative any better? Courage is not the absence of fear. I try to tell the story of my journey as it happened to me with honesty. If I say something that someone doesn't want to hear, that has to be okay. It is my experience. It happened...all of it. It is truth. Truth might just be the only weapon we have in our battle to find justice for mothers..to get recognition of the fact that our human rights were ignored and our children's civil rights were taken when they were taken from us. It's not my job to protect another adult from the truth. That kind of thing is really not fair to anyone. No matter how close you are to someone, no matter how much that person means to you, you owe yourself and them the truth. Only is adoption-land and the ins and outs of reunion can the truth cause such rancor. However, to tell the truth means that you respect the other person enough not to patronize or condescend. I refuse to treat anyone I love like they are emotional idiots. Today, we take our Rocky back to the oncologist. The poor little fella has had to have another malignant MCT removed and now must be treated for the cells the vet wasn't able to get with surgery. Life goes on. It may not be ideal, but it is good. I do have a life. But, on the outs or in like Flynn, I carry pictures of what is true and all the whos and the wheres in my heart. No one can take that away from me, now. It is sooo challenging to stay true to oneself, but worth it. Respecting each others truth in adoption, is one way we can do that. We don't have to agree or even like the other person's point of view, but I believe it is important to respect and validate their choice to have that point of view. I am sorry to hear that your animal friend is experiencing such a horrible illness. What kind of pet do you have? He's a rat terrier mix, Liz and the apple of our eyes. The checkup today was a good one.